Thanks for visiting Delaware butterflies. This small Atlantic Coast state ranks on the lower end of state butterfly diversity with 70 species of butterflies and 50 of skippers. What Delaware lacks in butterfly species they more than double that by their butterfly enthusiasm. Two exhibits show visitors the wonders of Delaware butterflies. The first, the butterfly house at the Ashland Nature Center hosts about fifteen species of native butterflies and is open to the public from June through September, the peak of butterfly season. It’s located a short distance west of Wilmington, and a few miles from the Pennsylvania border. Visitors also have the opportunity to see other attractions such as a hummingbird exhibit. Not to be outdone, The Botanical Garden at the University of Delaware have hosted a native butterfly garden and trail for close to twenty five years. It’s located in Newark, DE, close to both the Maryland and Pennsylvania borders. Residents interested in building their own Delaware butterfly garden can get great tips on the larval host plants and nectar plants for their favorite butterfly species. The top picture shows an Eastern Tiger Swallowtail, the official Delaware state butterfly. Some people might be unfamiliar with the fact that a handful of trees are host plants for the Eastern Tiger Swallowtail. 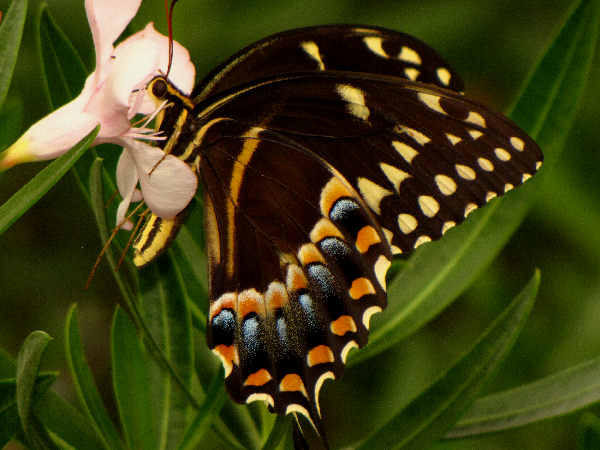 Residents can choose popular trees and shrubs such as lilac, willow, birch, ash, wild cherry and tulip poplars to insure they make a home for the Eastern Tiger Swallowtail from year to year. Brushfoot butterflies, another group of large showy butterflies are also popular butterfly garden guests. Butterfly identification usually begins with color. So, the butterfly section is split into nine different categories based on wing color and/or the butterfly family to help all visitors and members easily categorize and document their butterfly pictures. Anyone looking for butterfly identification help can press the green butterfly button for more information. Pieridae is the formal name of the family that consists of the butterflies with white wings and yellow wings. 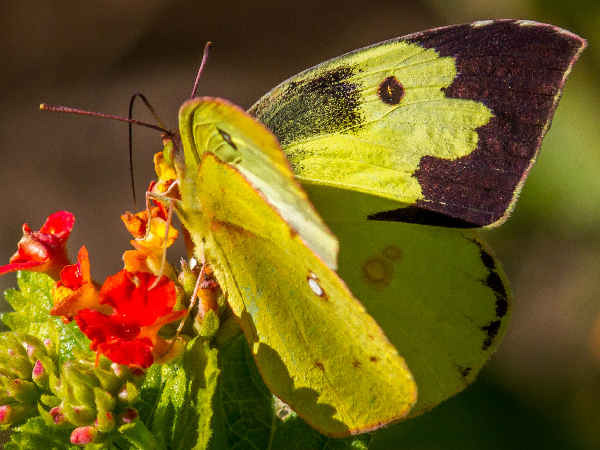 The picture shows a Barred Yellow butterfly. The Southen Dogface and only makes occasional stray visits to the state. Sleep Orange are only found in New Castle County. The other species are common in the state. All three of the white butterflies are found in the state. 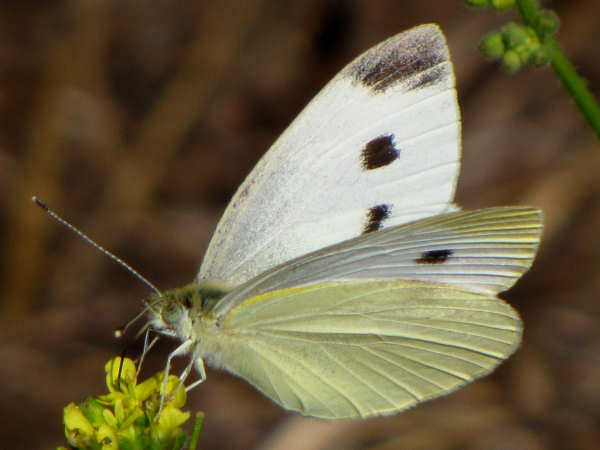 The Cabbage White is the most common in residential areas because the larvae feed on all your favorite vegetables in the cabbage family. Local Philadelphia Flyers fans might be partial to the Falcate Orange Tip, a white butterfly with a nice patch of orange at the end of each wing. All of Delaware’s Gossamer wing butterflies can be found almost regularly throughout the state. 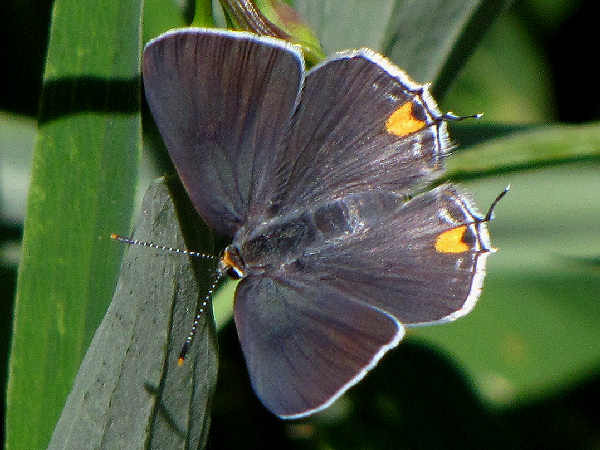 The picture shows a Gray Hairstreak, one of the most common species from coast to coast. 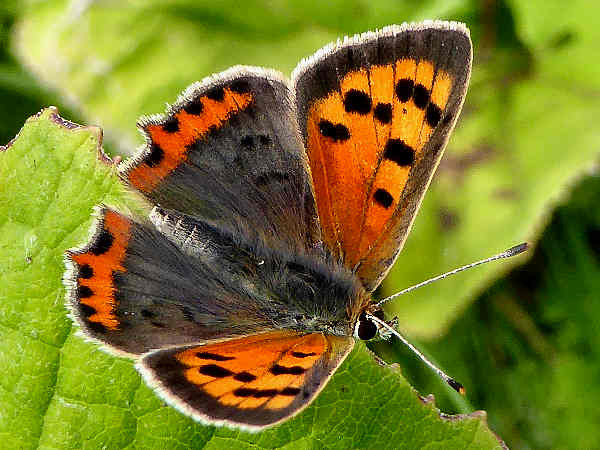 When looking through the bushes for the blues and hairstreaks, keep an eye out for the two copper butterfly species. 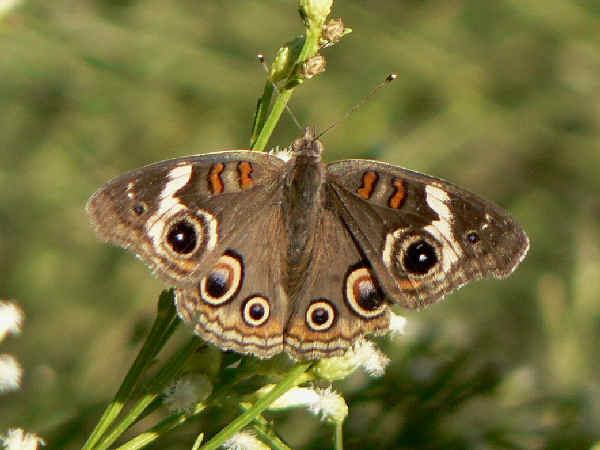 They have brown wings and their small size means that novice butterfly watchers might overlook them. A few of the Brush Footed butterflies such as the Gulf Fritillary, Gray Comma and Milbert’s Tortoiseshell only make an occasional stray appearance in the state. Otherwise, the list presents a very healthy and diverse population of butterflies that most residents and visitors will see at local parks and gardens. Many of the Brushfoots have orange wings. Keep and eye out for the wing pattern to help with butterfly identification. 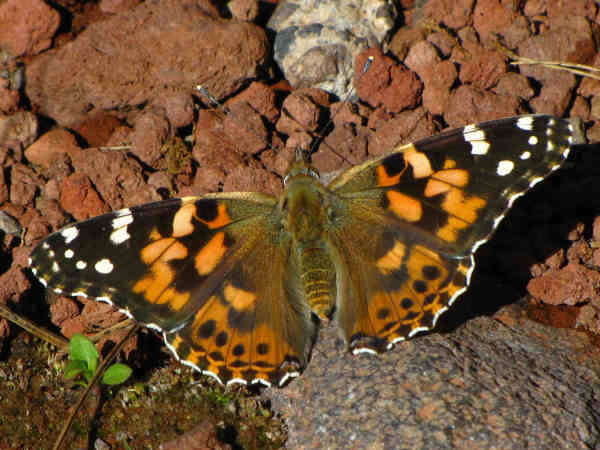 The picture shows a Painted Lady. 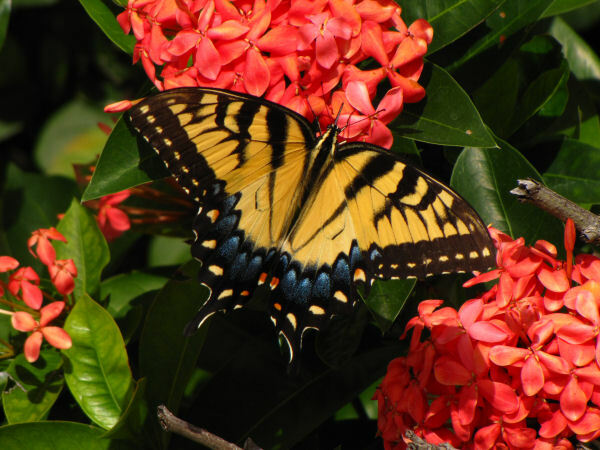 Of the six swallowtail species, the Palamedes and Giant Swallowtails appear in Delaware as strays. The picture shows a Palamedes. Finding one in the state can be a real treat.